Your restaurant has an established presence on social media outlets. People are finding your restaurant and using Facebook Check-in to broadcast when they’ve stepped into your restaurant. Business is good, but could always be better. How can you leverage your strong presence on Facebook and other social media outlets to incentivize customers to return or even come to your restaurant for the first time? Facebook Offers are a great place to start since they’re easy to set up, get more page views than regular posts, and are and an excellent lead generation tool for your restaurant. 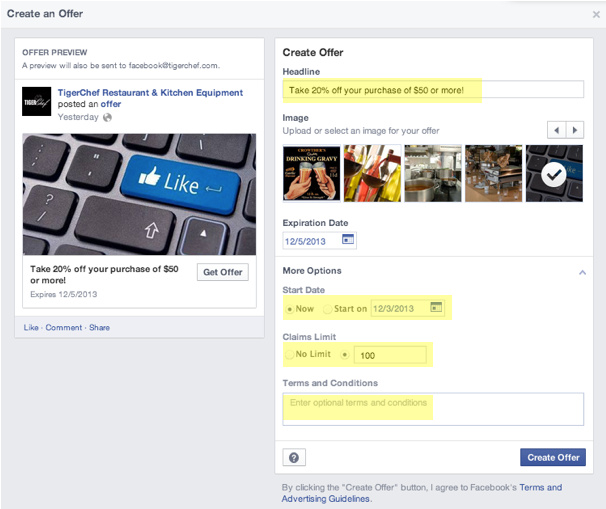 People who claim a Facebook Offer are sent an email with customizable text. Make your restaurant’s fans a compelling Offer with an attention-grabbing headline, an attractive thumbnail, and date and offer limitations to lend your campaign urgency. Once it’s set up, you need to promote your offer and set parameters on the target audience (fans vs. non-fans, gender, age, etc.) In the final stage, you will set your budget and see an estimate from Facebook on how many people can be reached. Lastly, make sure the ad takes them to a solid landing page that will compel your fans to take the action you want, whether it’s downloading your coupon or giving you their email address. Many services exist, built specifically to answer this question. Services like www.couponsindemand.com enable you to easily embed coupons in your newsletters, Facebook pages, or website. They can easily be shared on customer’s Facebook and Twitter profiles, and offer a free trial for the first year. Other services such as Groupon can be useful for starting a flow of traffic but should come with a warning label: don’t start a Groupon campaign for your restaurant without a long-term marketing strategy in place. Groupon deals are known to be very cheap in order to bring first-time customers but will be SO good for your customers that you probably won’t see profits from them. If you decide to use Groupon, make sure you have an exit strategy and your new customers don’t get too used to paying 50% for a meal at your restaurant. Other services such as The Coupons App are widely popular and can efficiently use geo-targeting to deliver your coupon to customers as they come within 20 miles of your restaurant. The cost of this app is $149.95 for 3 months of use (and you can cancel it anytime.) Other benefits include their own use of social media (over 49k followers on Twitter) and generating content such as this tweet several times a day. Imagine this is about your restaurant. With you as their client, they have a vested interest in bring you more business, so use what’s at your disposal and take your restaurant marketing up a notch!